Facebook CEO Mark Zuckerberg walks to a meeting with Senator John Thune (R-SD) on Capitol Hill in Washington, April 9, 2018. Judiciary Committee Chairman Chuck Grassley said users "deserve to know how their information is shared and secure," and that he wants to explore with Zuckerberg ways to balance safety with innovation. "We didn't take a broad enough view of our responsibility, and that was a big mistake. It was my mistake, and I'm sorry," Zuckerberg said.Zuckerberg was called to testify after news broke last month that personal data of millions of Facebook users had been harvested without their knowledge by Cambridge Analytica, a British voter profiling company that U.S. President Donald Trump’s campaign hired to target likely supporters in 2016. 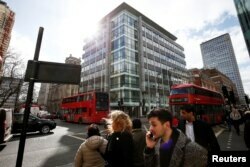 FILE - People walk past the building housing the offices of Cambridge Analytica in central London, Britain, March 20, 2018.